The Baltimore Ravens, defending NFL Champions, had gotten off to a slow start in the 2001 season but were coming off back-to-back wins and were 5-3 as they faced the Tennessee Titans on November 12. Head Coach Brian Billick’s team had reached the Super Bowl following the 2000 season thanks to a superb defense and ball-control offense. The defense was still strong, and while QB Elvis Grbac had been signed away from the Chiefs to upgrade the passing attack, RB Jamal Lewis, key to the ground game as a rookie, was out for the year with a knee injury suffered during training camp. The Tennessee Titans, coached by Jeff Fisher, were struggling at 3-4 after having put together consecutive 13-3 records and winning an AFC title in 1999. QB Steve McNair was playing well but RB Eddie George appeared to be on the downside of his fine career and injuries were a problem, especially with the once-formidable defense. The Ravens had won convincingly when the teams met at Baltimore five weeks earlier and, coming into the rematch, McNair was suffering from a sinus infection and was not at full strength. There were 68,798 fans in attendance at Nashville’s Adelphia Coliseum for the Monday night game. The teams traded punts during the first quarter, with neither offense able to move. A promising series for the Ravens was highlighted by back-to-back pass completions by Elvis Grbac to WR Brandon Stokley for 18 yards on a third-and-seven play and 16 yards to FB Sam Gash. But after reaching the Tennessee 33, Grbac was sacked for a seven-yard loss by DE Jevon Kearse on a third down play and they had to punt. Early in the second quarter, the Titans put together a long drive that started at their nine yard line and reached the Baltimore 30. Steve McNair completed four passes, two of which converted third downs, and also ran for 13 yards while Eddie George contributed 26 yards on seven carries. However, they came up empty when Joe Nedney’s 48-yard field goal attempt was unsuccessful. 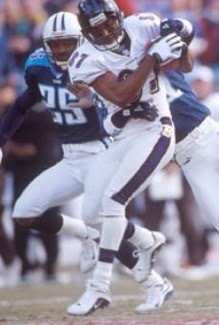 The Ravens responded by moving into Tennessee territory, but a Grbac pass was intercepted by LB Keith Bulluck. With 3:35 remaining in the half, the Titans put together another long series. At one point, McNair completed three straight passes for 25 yards to reach the Baltimore six, but the drive stalled there and a field goal by Nedney was wiped out by a holding penalty. The second try for a field goal had to be aborted due to a bad snap and holder Craig Hentrich’s desperation pass was intercepted. The game remained scoreless at halftime. The Titans got a break early in the third quarter when WR Qadray Ismail fumbled after catching a pass and DB Daryl Porter recovered near midfield. They were unable to capitalize, however, but following a punt they got the ball back on another Baltimore turnover, this time the result of a botched punt. Getting the ball with first-and-goal at the Ravens’ eight, the Titans still couldn’t reach the end zone but finally broke the scoreless deadlock with a 27-yard Nedney field goal. The Ravens came right back when WR Jermaine Lewis returned the ensuing kickoff 76 yards to the Tennessee 16. They also ended up having to settle for a field goal by Matt Stover from 31 yards to make it 3-3. The Titans responded with an eight-play, 71-yard drive. McNair threw six passes, including one to TE Brian Natkin for 27 yards and the last to WR Kevin Dyson for a 22-yard touchdown. Nedney added the extra point and Tennessee was ahead by 10-3. Now it was time for the Ravens to move on offense. RB Jason Brookins ran three times for 18 yards and Grbac completed two passes to Ismail, the second for a 57-yard TD. Stover’s extra point again knotted the score. Heading into the fourth quarter, the Ravens got another break on a turnover when George fumbled and LB Peter Boulware recovered at the Tennessee 18. Four plays later Stover kicked a 33-yard field goal that put the visitors back in front at 13-10. The teams traded punts until, starting at their 14 yard line with 8:17 remaining to play, the Ravens put together another scoring drive. Grbac thew to TE Shannon Sharpe for 15 yards in a third-and-six situation and Brookins had a 25-yard run to the Tennessee 27. The eleven-play series ended with Stover kicking another field goal, this time from 30 yards, to put Baltimore ahead by six points with the clock now showing 3:10 to go. 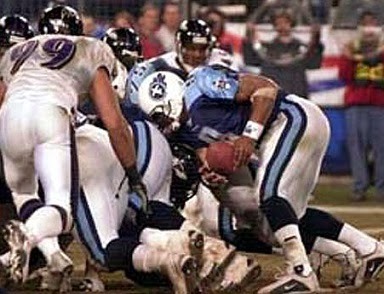 Following WR Derrick Mason’s 22-yard kickoff return, the Titans moved methodically down the field. McNair completed a 10-yard pass to Dyson on a third-and-six play and, after being sacked by Boulware for a loss of six yards, had four straight completions to get the ball to the Baltimore 35. A roughing-the-passer penalty added another 15 yards and McNair then threw to George for eight yards to the 12. McNair’s next pass fell incomplete but, on third-and-two, he hit Mason for six yards. The Titans took their final timeout and McNair missed on his next two throws before connecting with Dyson for five yards down to the one. On fourth down, and lining up quickly with the final seconds ticking away, McNair appeared to score on a quarterback sneak, but a flag was thrown for an offsides penalty. Following a great deal of confusion and consultation by the officials, the play was ruled a dead-ball foul and, with the ball a foot away from the goal line, the Titans were given one last shot. Once again McNair kept the ball (pictured at top) and, when he couldn’t penetrate the middle of the line, tried to go outside. He was stopped short of the goal line by SS Corey Harris and the Ravens were winners in dramatic fashion by a final score of 16-10. The Titans won the statistical battle, accumulating more total yards (318 to 238) and first downs (20 to 12), and held onto the ball for 35 minutes. The Ravens accumulated just 55 yards of their total in the first half. Baltimore recorded six sacks, to three by Tennessee, and both teams turned the ball over twice. Elvis Grbac completed 15 of 27 passes for 192 yards with a touchdown and an interception. Qadray Ismail (pictured at right) had 8 catches for 129 yards and a TD. With veteran RB Terry Allen lost to an injury after one carry, rookie Jason Brookins ran for 57 yards on 14 attempts. For the Titans, Steve McNair went to the air 48 times and completed 27 of those throws for 256 yards and a TD with none intercepted. He also ran the ball 6 times for 19 yards. Derrick Mason had 12 pass receptions for 99 yards and Kevin Dyson contributed 6 catches for 68 yards and a score. Eddie George rushed for 71 yards on 22 attempts. The Ravens lost to the Browns the next week but won the next two on the way to a 10-6 record and second place finish in the AFC Central. They won in the first round of the postseason but lost to the division-rival Steelers in the Divisional playoff game. Tennessee continued to struggle and ended up at 7-9 for fourth place in the division.